Lauren (Chism) Schmidt joined the Center in January of 2016. 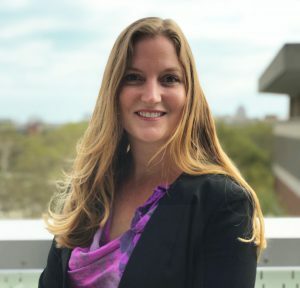 Lauren gained fame at IUPUI as the director of the campus’s Themed Learning Communities, which was named “Best Learning Communities” in the U.S. News and World Report each year she led the program. While in this role, she taught a number of freshman seminars involving religious studies themes, and served as resource faculty at the National Summer Institute for Learning Communities, co-chair of the National Learning Communities Conference, and co-editor of Building Synergy for High-Impact Educational Initiatives: First-Year Seminars and Learning Communities. She went on to join the Indiana University School of Medicine as Director of Programs and Evaluation in the Office of Faculty Affairs and Professional Development. With a degree in Religious Studies and considerable experience as a teacher and researcher, in her own right, Lauren is excited about helping the Center move into a new era of more and larger programs of research and public teaching.